This entry was posted on Aug 02, 2008 at 22:50 and is filed under History, Paradoxes, Politics with tags Benito Mussolini, Bossi, Communism, Fascism, Fascist Italy, Germany, Greece, History, Immigration, Italian Heritage, Italian History, Italian Invention, Italian Politics, Italian Prejudice, Italian Shame, Italy, Lega Nord, Maroni, Mussolini, Nazi Germany, Nazism, Politics, Roberto Maroni, Scapegoat, Umberto Bossi. You can follow any responses to this entry through the RSS 2.0 feed. You can leave a response, or trackback from your own site. That’s not wholly right for some reasons. The Lega Nord party is racist toward 50% of italians too, and has the favour of a bit of people in Veneto and less people in Lombardia. Apart from that almost everybody think they are just dumb morons…well, it’s not people thinking, they actually are morons. And they can’t even score a 10% on general election, so they’re not that dangerous. Instead, there are a lot of people that are really fascist, and I mean people that say Mussolini was good and such things. LOL they miss Mussolini! 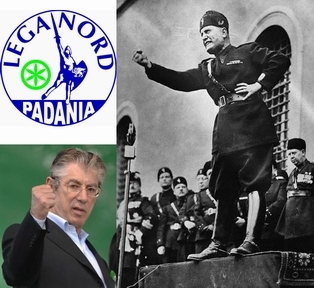 Well, if the Lega Nord is a joke, they’re a cancer. They’re a real, serious problem. They are morons, indeed. But this fact does not imply they are not dangerous. Every radical group which endorses violence must be closely monitored. In the comune where I live, in Lombardia, Lega Nord got 60%. No comments about that. Yes that’s true but I wanted to tell the difference between them and the new fascist group that are rising now like poison mushrooms. About the Lega Nord, I really think they’re no able to take advantage of nothing, for the moment…they got 60% in Lombardia (I didn’t think that much) but the total is just the 8%. I agree with you that they should be closely monitored, i.e. in a mental hospital. Actually the big triumph at the elections of PDL was thanks to Lega Nord; it is not anymore a little party; it has become bigger and actually it is growing more and more. Unfortunatelly. In Europe, the alleged “cultural” is indeed evolving to ethnic and religious prejudice. History has plenty of examples showing where this hatred path finishes.